Liturgical worship is primarily the work of the assembly. All of the faithful gathered at Mass participate in the act of worship and by his/her presence help to truly create a communal celebration! Some of the faithful feel called to further participate in the Mass through specific ministries. 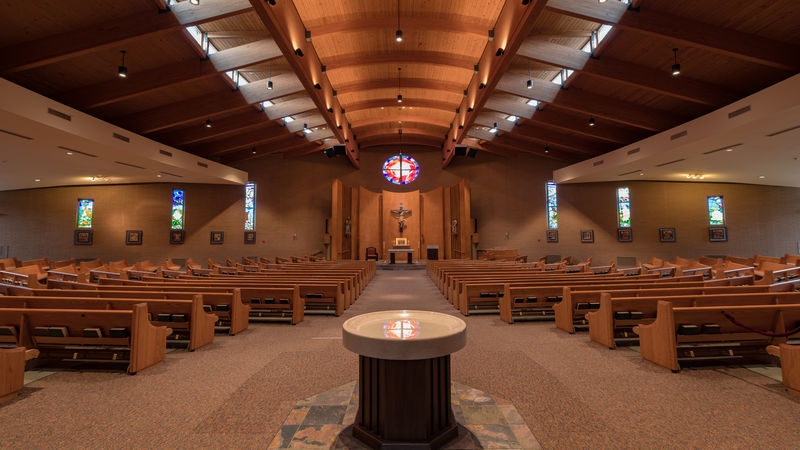 There are a variety of Liturgical Ministries at Our Lady of Grace Parish. Each of these ministries provides an important service in assisting in the worship of the community. For further information or to inquire about serving in a particular liturgical ministry, you may contact the parish office at 724-838-9480. Current ministers can use the Liturgical Ministries Information Form to update their Mass preferences or contact information. Sacristans work behind the scenes to make the necessary preparations for the Eucharistic Celebration by arranging the liturgical books, vessels, and other items necessary for the celebration of Mass and cleaning-up after the Mass. The duties of this ministry also included assuring that enough liturgical ministers are present to appropriately fulfill the duties. Any female or male who is a fully Initiated Catholic and is able to arrive 30 minutes prior to Mass and stay 20 minutes after Mass can serve as a Sacristan. Sacristans may be, but are not required to be, Extraordinary Ministers of Holy communion. Altar serving is a great opportunity to share your faith with the parish community in a very active way through service at Mass and other Liturgies. These opportunities include weekend Masses, funerals, weddings, Holy Days, and other celebrations based on the server's availability. Persons serving in this ministry assist the priest by carrying out roles such as: leading the procession by carrying the Crucifix and candles; assisting the priest with the Roman Missal; and setting the altar. Any female or male who has received the Sacrament of the Eucharist (1st Holy Communion) can become an Altar Server. This is an excellent way for young people to participate in a liturgical ministry. Servers can expect to serve once or twice a month, as scheduled. Adult Altar servers are a vital part of our parish’s ministry to those who are grieving at the time of a funeral. Adult altar servers help to set up the sanctuary for funeral masses and provide assistance to the priest during the Liturgy. All servers will be trained. Extraordinary Ministers of Holy Communion (EMHC) are women and men appointed by the pastor to assist by helping to give the Body and Blood of Christ to the community gathered at Mass. EMHC are fully initiated Catholics (received Baptism, Communion, and Confirmation), who are in good standing in the Catholic Church and typically at least 16 years old. Persons who desire to serve in this capacity will be assisted by parish staff in learning how to carry out this ministry. EMHCs can expect to serve at weekend Masses about twice a month as scheduled and are invited to serve at Masses for Holy Days. The community gathered at worship on the weekends extends the gift of Holy Communion to our brothers and sisters who cannot be present for the Mass. Some Extraordinary Ministers of Holy Communion are assigned to take Holy Communion to the sick and homebound, as well as to those in nursing and personal care homes. Persons who take Holy Communion to the homebound can expect to visit personal homes or nursing homes once per month as scheduled. Lectors help others to hear the Word of God at Mass by proclaiming set biblical readings. Lectors are fully initiated Catholics (received Baptism, Communion, and Confirmation), who are in good standing in the Catholic Church and typically at least 16 years old. Persons who desire to serve in this capacity will be given the appropriate readings and assisted by parish staff in learning how to carry out this ministry. Lectors can expect to serve at weekend Masses about once a month as scheduled and are invited to serve at Masses for Holy Days. Music ministry plays an important part in our worship by contributing to the Mass and other celebrations. Our music ministry is primarily composed of volunteers who are not musically trained, but who enjoy music, particularly singing. There are numerous ways to be involved in this ministry. Any questions can be answered by contacting our Director of Music Ministry, Marisa Cazden, at 724-838-9480 or mcazden@dioceseofgreensburg.org. Cantors are individuals with a pleasant voice, good presence, and an ear for music, who assist the community in song. Based on skill and experience, which is determined through an informal audition, persons may begin serving in this ministry as young as 6th grade. Cantors can expect to rehearse regularly and follow a rotating schedule based on need. The Premiere Choir is made up of individuals, 6th grade and older, who enjoy singing and have a good ear and ability for learning music. A very informal audition is requested for voice placement (soprano, alto, tenor or bass). The premier choir rehearses regularly on Wednesday evenings and sings at the 10:30 a.m. Sunday Mass, September through May, as well as during Christmas and Holy Week. The Memorial Choir provides music for parish funerals, which usually take place on weekdays. No audition is required and rehearsals take place a half-hour prior to the funeral Liturgy. The parish community welcomes young musicians, instrumentalists and singers, who are in grades 6-12, to participate in the music ministry, especially at our monthly Youth Masses. The Youth Masses typically occur on the third Sundays of the month (except during the summer months) and at the 4 p.m. Christmas Eve Mass. No audition is required and music is provided. Ushers serve by assisting in seating worshippers, taking up the collection, arranging for gift bearers, and giving direction in the movement of the assembly, particularly at Communion time.